USPS Announces The “Forever” Stamp: Is It Worth Your $0.39? Yesterday, the United States Postal Service announced the introduction of a “forever” postage stamp. Here’s how it works: whenever you buy a first class postage stamp, it will no longer be marked with a cash denomination on it like current stamps are. Instead, it will merely say “First Class” on it. Once you buy it, you can use it at any point in the future. For example, if you buy a 39 cent “forever” stamp today, and then the postal service raises rates a few times, leaving a stamp’s price at fifty cents in 2020, you could still use that same “forever” stamp to mail a letter, even though you paid only 39 cents for it. Why is the postal service doing this? They have two reasons. First, by doing this, they don’t have to make one, two, and three cent stamps in large quantities any more, as these stamps now cost as much or more to make than their face value. Second, by giving them your thirty nine cents now, you basically allow them to use that money immediately while you might not use those stamps for a very long time. This period allows the postal service to maximize the use of those stamps. Is this a good deal for individual stamp buyers? Before we dig into the calculations, it should be noted that in general this increases the flexibility for consumers without raising prices, so by default it is a good deal for consumers – anything that makes a product better without increasing prices is a good thing. How do I maximize the benefit? Can you really gain a lot by stocking up on stamps before a rate increase? 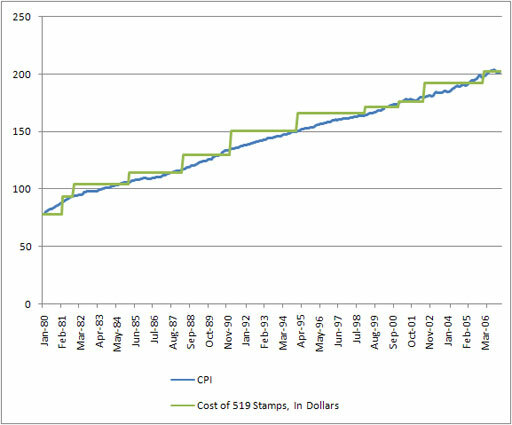 The only way to really tell is by looking at the recent history of stamp price increases. I’m only going to use price increases since January 1, 1980, where the price was 15 cents for a first class stamp. Thus, between January 1, 1980 and January 1, 2007 (a period of 27 years), stamps saw an average annual increase of 3.6023%. On the other hand, in January 1980, the Consumer Price Index (the most common number used to estimate inflation) was at 77.8 and in January 2007, it was at 202.4. Thus, between January 1980 and January 2007, inflation saw an annual average of 3.6046%. 3.6023% … 3.6046% … it turns out that the rate of postage stamp increase is amazingly close to the rate of inflation in recent years. This is because that postage stamps are hedged to match inflation, as the postal service isn’t out to make a profit, but to break even. However, there is one big difference: inflation is fairly steady, but the postal service jumps regularly. This means that if you buy a bunch of stamps just before a jump (even a year’s supply of them), you can beat inflation by quite a bit with your postage stamp purchase. As you can see, they match reasonably well, but something else should stick out at you: stamps were at their biggest bargain just before the rates went up. In other words, when the “forever” stamp goes into effect, buying a bunch of stamps just before a rate increase is a very effective way to save money. You can easily outpace inflation with this “investment” and even outpace a lot of other investments, including money market accounts. Of course, over a longer period of time (a period of two stamp rate increases or more), the price increases begin to match inflation, and that’s not a good investment. To summarize: I plan on buying a few hundred “forever” stamps just before the next rate hike, but not more than I could use in a year. This lets me maximize the benefit of beating a rate hike, but doesn’t lock me into an “investment” that merely stays the same as inflation.